Wagtail reaches 1.0 today, 17 months after we launched our CMS as an open source project. This is a significant milestone for us. 1.0 means we're confident that Wagtail is a solid piece of software. The rough edges have been smoothed off, the gaps have been plugged, the kinks have been straightened. Wagtail 1.0 has a refined user interface, a comprehensive test suite and a decent set of documentation. Installation and site setup are much simpler now than in previous versions. The latest versions of Django and Python are supported. The API, previously a separate module, is now improved and included in the core app. Most importantly, 1.0 is the first official release to include StreamField, a feature which we believe sets Wagtail apart from other content management systems. The Royal College of Art launched on Verdant, Wagtail's predecessor, in December 2013. 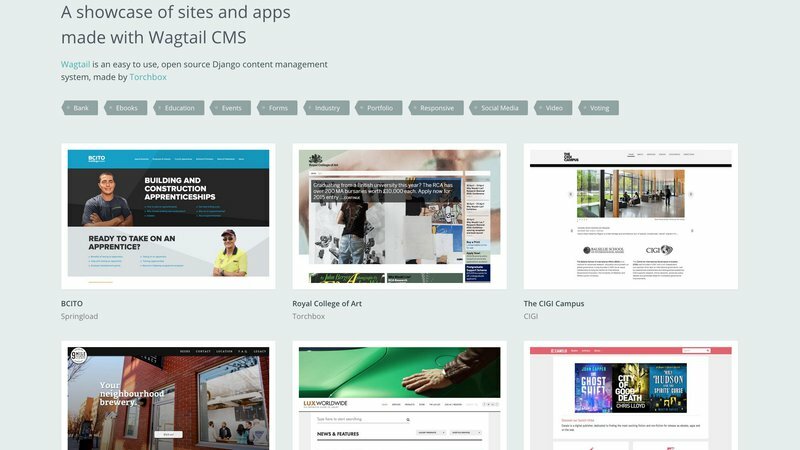 Before Wagtail there was Verdant, a CMS designed for and commissioned by the Royal College of Art, the "top university in the world for Art and Design", according to the latest rankings. The RCA had three clear requirements for their new CMS: no limits on the visual presentation of their content; a fast, intuitive interface for their authors; low response times for their audience. Torchbox launched rca.ac.uk on Verdant at the end of 2013. 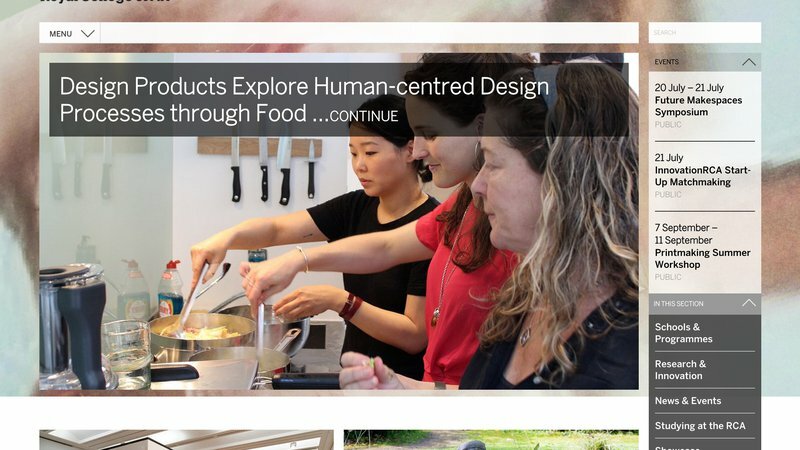 The site was acclaimed for its fresh but clear design, and the college's editorial team were overwhelmed with new content from staff who could understand - and even enjoy! - the new authoring interface. We launched Wagtail (named after the charming little birds who hang out on the grass outside our Oxfordshire offices) as an open source project at Django Weekend, in February 2014. Matthew gave a talk, Olly made a slick screencast, I submitted a post to Hacker News, we asked some friends to tweet about it and that was it. Within a few hours, the responses started coming. The post stayed on the Hacker News front page for almost a day, and Wagtail was the top trending project on Github for a few giddy hours. The feedback was almost all positive, apart from one bruising comment from a core Django dev, warning people to 'stay away until this project has a proper test suite'. He was right, of course. Now we're at 94%. We were taken aback by the enthusiastic response from the developer community. I've told this story a few times: one evening a couple of weeks after launch I noticed a Github issue about an edge-case permissions anomaly, submitted by someone in Sweden. Cool, I thought, it would have taken us ages to have spotted that. Then I went to bed. In the morning I checked my emails over breakfast. Overnight, a stranger from Mongolia had submitted a fix! And his Github profile photo showed him on horseback, somewhere on the Great Steppe! The miracle of open source! Global altruists doing our work for free! Of course, it wasn't all so easy. This is our first big open source project, and we were unprepared for the effort we needed to put in to manage our nascent community. We lost some excellent early contributors by failing to respond quickly or positively enough. We didn't articulate our direction adequately, which meant that some developers wasted time submitting pull requests which didn't fit our plans for the project. Our documentation fell behind our features. Springload built madewithwagtail.org, showcasing new Wagtail sites, on a weekend hack day. In Wagtail, of course! Three things helped us steady the ship. The Wagtail team at Torchbox settled into a clearer routine, with weekly update meetings, scheduled releases and a defined budget for continued investment. We launched several more Wagtail sites for our own clients, which focused us on solving real-world problems for the project. Most importantly, several fantastic agencies started to communicate with us about how they were using Wagtail, the changes they wanted and the contributions they could make. Context commissioned the static site generation feature. The University of South Wales commissioned intelligent cropping. An as-yet-anonymous organisation paid for the API. And then the Antipodeans got involved; in particular Springload in New Zealand and Takeflight in Australia have embraced Wagtail enthusiastically and contributed some extraordinary work, with skills that we don't have ourselves. At the same time, the number of new sites made with Wagtail starting growing dramatically. Beyond built a beautiful site for the NSPCC. One of the world's biggest brands launched a Wagtail site for its primary product. A broadcaster who you've heard of commissioned us to migrate an enormous, high profile site, which is scheduled to go live on Wagtail in a month or so. Two of the leading universities in the US are switching to Wagtail. Europe's biggest ticket agency is about to launch its new platform on Wagtail, after just five months of development. Today's launch is the culmination of the investment we've made, the fantastic contributions from developers and agencies around the world, the lessons we've learned from the many Wagtail sites now in production. Wagtail 1.0 is faster, runs in more places, is easier to install and has a solid API. It's ready to build your pixel-perfect five page brochure site, as well as your massive online newsroom with millions of articles, hundreds of editors and an impatient global audience. But the big feature is StreamField, Wagtail's solution to the CMS dilemma of structured content versus editor flexibility. StreamField lets you create rich, varied pages, while maintaining a clear separation between content and presentation. In other words, you can build narrative pages, like this one, on Global Witness's Wagtail site, by quickly adding and reordering blocks of content – text, images, videos, infographics, maps, tables – and then publishing it on your responsive site, to a native iOS app via the API, as a print-ready PDF or e-book. In CMS jargon, it's the dream of COPE: Create Once, Publish Everywhere. We've been using beta versions of Wagtail 1.0 on our client projects for several months. StreamField is already changing the way we build websites, and we hope it will do the same for you. There's already a long list of features lined up for Wagtail 1.1 and beyond, including a mobile app, more integrated multi-language support and continued UX refinements, but for now we encourage you to upgrade to our post-adolescent progeny, and show us what you can do with it.